Last year I started an experiment, to sign up to a bunch of campaigning organisation, and then find out what happened if I said ‘yes’ to every request they sent to me. So for a month, I did that for every email I got from 38 Degrees, Avaaz, Sum of Us and We Move. Over a month I signed petitions, emailed targets, donated, participated in surveys and RSVPd for events. The plan was to continue to do this into 2018, but then an election was called, and my inbox took a backseat. In fact, I didn’t open a single email from any of the above organisations for a year, but then I got interested again. A year later, would I still being treated like a very enthusiastic campaigner or a lapsed one, would anyone just stop sending requests to me, what might happen as a result of GDPR and would I see any effort to re-engage me? I was expecting to see more stewardship as I moved from an active to dormant supporter who hadn’t taken action for over a year, but only 38 Degrees got in touch to ask if I was still interested in hearing from them – all the other platforms just continued to serve up a very similar digest of emails. I also used the arrival of GDPR at the end of May to send a request to each organisation to provide me with the information they held on, which you’re meant to provide within 28 working days, as you’ll see below that’s something some, but not all organisations have been able to provide. That works out as 1 email every 2 1/2 days, although sometimes Sum of Us would actually send me up to two emails every day, and as many fundraising emails (each asking me to chip in a few pounds) as action ones – something that is clearly working as according to their 2017 annual report they raised $3.8m from donations in 2016. The only change in the types of emails I got was any of the more community focused requests stopped coming from June 2017 – for example when I was really active I was invited to webinars on data security, and probably as a result of volume of messages sent, but more Sum of Us emails ended up in my promotions Gmail inbox than any other organisation. Sum of Us responded to my information request with a big ZIP file of what information they held on me on their database. The themes of the emails were a real mix, some campaigns like those on the Bayer and Monsanto merger, and bees coming regularly across the year, with others being far more opportunistic – an email on train privatisation at a period when railway delays were prominent in the news here in the UK – but overall looking back across a year of campaign actions from them it felt like some threads emerging. I’d written before that I’d been impressed by the approach that Sum of Us took to fundraising and campaign innovation, and that has continued across the year I’ve been away – from actions focusing on a range of targets – for example, I really like the targeting of Liverpool FC when they accepted sponsorship from Tibet Water, and really excellent stewardship emails reporting back at the end of the year, making me feel like a valued member of the Sum of Us community (even if I was rather inactive). Despite sending almost two emails a week, everyone ended up in the ‘primary’ inbox in my Gmail – which matters as I’m much more likely to read those first when, but I also I found that sometime Avaaz would send me identical emails a few days apart, presumably working based on the knowledge I’d not open then! As you’d expect with a platform which works on global issues they topics for emails – a few themes that picked up for a while, for example on Gaza, but it’s hard to say that there were campaigns that they were sustaining across the year. 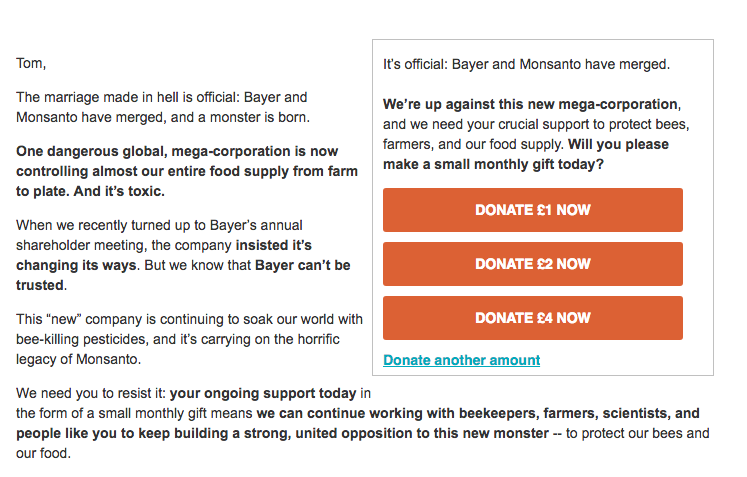 Having said that some of the smartest fundraising emails came from them, at a time they were being threatened by Monsanto they asked me to chip in to help support their legal fees – and stand up to. Like Sum of Us they were also really active at writing regular report back emails – often entitled ‘what happened after you signed that petition’, perhaps an indication that people are sceptical of what indeed does happen when they sign a petition. Oh, and also loved the inclusion of gifs in some of the emails, and variety in action templates. WeMove is less well known in the UK, but it’s a pan-European platform focusing on decisions at an EU level, and perhaps because of that I’ve heard nothing from them since GDPR came into force, and most of the emails from them in May where about opt-in. I’d have argued these weren’t necessary as I voluntarily opted in at the start of the experiment last year – so I was surprised that they’d not opted me in on their database. WeMove as of the time of writing still hasn’t responded to my information request. The platform early on relied on using surveys to get a sense of what their members are looking for, but that seemed to drop off in my journey from October. 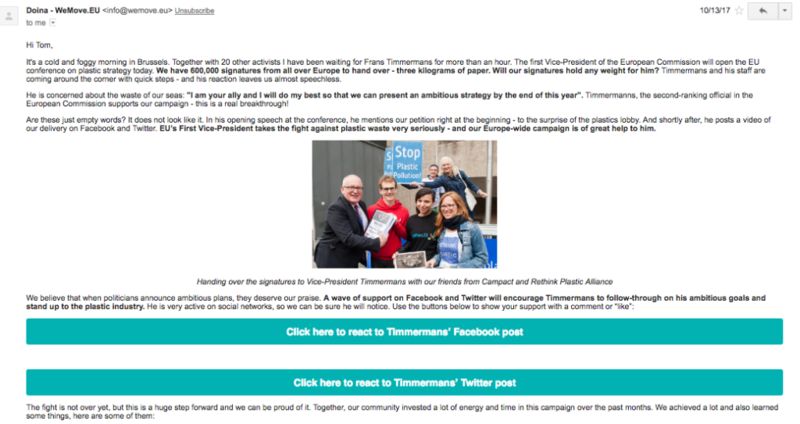 Their emails were generally longer in length than the other platforms, but featured a bunch of interesting innovation in approaches, for example, the email below where they asked me to react on the Facebook page of Frans Timmermans, Vice President of the EU Commission on banning single-use plastics. The big campaign they’ve been running has been on banning glyphosates – harmful weedkillers that appear in many foods, where they’ve been successful at getting their movement to arrange an EU Citizens Initiative, which requires collecting 1 million petition signatures from at least 7 member states(s). That works out at an email every 3 days – but I’ve actually heard almost nothing from 38 Degrees since December 2017, with the vast majority of messages in 2018 ending up in my spam folder. Something that 38 Degrees appears to be aware of as many of their messages ‘Please add 38 Degrees action@38degrees.org.uk to your contact list so that you never miss an email’ so the volume could have been much greater than that. 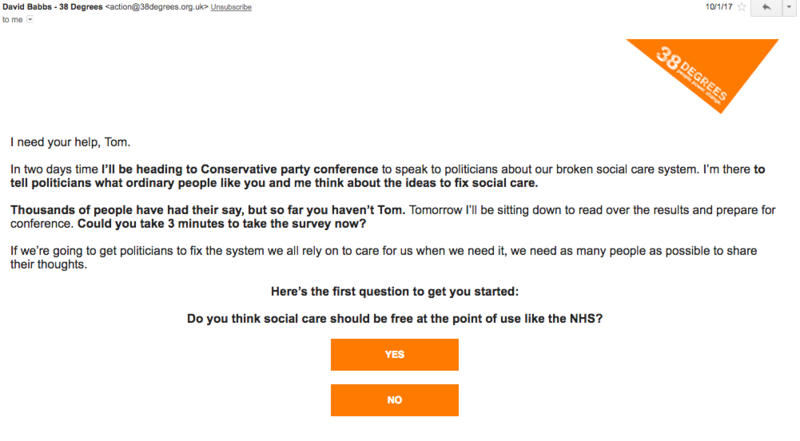 Unlike the other platforms, 38 Degrees still use lots of quick surveys – asking me to answer just a single question in the body of my email, presumably as a way of getting my attention to take action as opposed to a way of shaping the priorities of the platform. They also offer longer surveys when they’re looking to get member input into their plans, especially following key external moments like the June 2017 General Election. Lots of the actions I was invited to take were around the key campaigns for 38 Degrees on protecting the NHS and Brexit, although there was , they’re also the only platform to use lots of personalisation in the subject lines of emails, often mentioning my constituency or MP in it – a subject of some personal frustration if I’m honest as my MP, Rosena Allin-Khan is still a practising doctor so I find the ‘can Rosena Allin-Khan MP save the NHS’ subject lines a little lacking in political smarts! Oh, and the asked me if I wanted to buy some Christmas Cards from them – which I wasn’t expecting! Really interesting round-up. Thank you for sifting through such a mound of emails! That’s a hell of a lot of work Tom. Consider this bookmarked for when my new person starts! Thank so much and sorry for any inconvenience. Hi David – thanks for the quick response, and no inconvenience caused. Someone from your team came back to me today so it’s now sorted – so I’ll update the blog to reflect that. 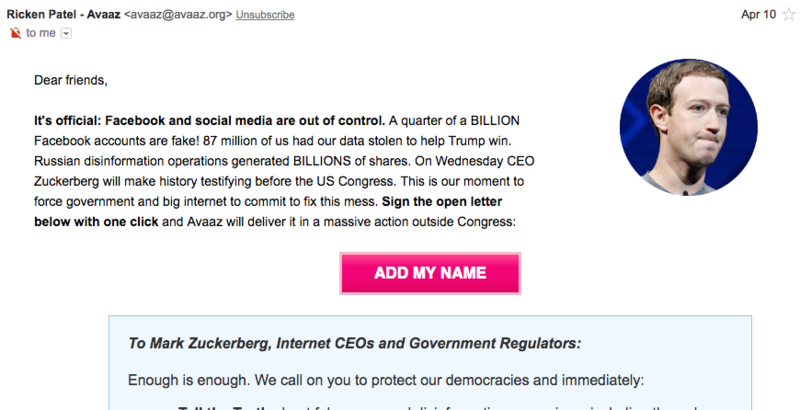 I made the initial request on 27th May via https://avaaz.desk.com/customer/portal/emails/new, and got a reply with case #98190 attached to it on 30th May. Thanks! Great post! Really makes me consider which platforms to reach out to when we look for campaign partnerships. About to share this around the team. Thanks.